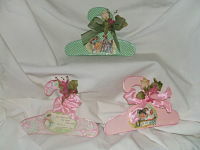 This little trio of hangers was designed to display baby's vintage dresses A nursery rhyme character and flowers grace the center of each. Colors are: 1 pink, 1 green, 1 blue, whille supplies last. Priced at $ 25.00 for three.